More on that Singapore Math thing: So what was wrong with American math teaching in the first place? For those of you who just came in: my major writing project at the moment is a nonfiction book called Singapore Math Figured Out for Parents, which is just that. As I finish it I'm posting some sections that may be of general interest to parents, math educators, and nerds here. The following is an excerpt from Part Zero, part of a section of a brief and necessarily incomplete history of math teaching in America. To clarify things for newcomers, especially those trying to get the hang of this new Singapore Math stuff, Singapore Math was developed primarily under the direction of Dr. Kho Tek Hong in Singapore in the early 1980s, when that very small nation was realizing that their only hope of not being swallowed by more powerful neighbors, either politically or economically, lay in developing a modern high-tech workforce. It's a bit hard to tell how much of the insight and work was Dr. Kho's directly and how much was his management, because he's a modest person, in addition to being extremely good at what he does. Singapore Math is associated with the elevated test scores of the half dozen nations that have adopted it thoroughly, most of them in Asia. In the United States it is coming in piecemeal via various charter schools (many nominally for the gifted and talented), but some parts of it have been incorporated into the Common Core. This gives me a more than uneasy feeling because one thing American taxpayers don't like to pay for is the needed teacher training to make curriculum reforms work; many great programs have succeeded beautifully in pilot programs and then been rolled out in the form of a pile of textbooks and a superintendent's orders to stay a week ahead of the kids, and have collapsed because learning a genuinely new way of teaching takes time, energy, focus (and thus enough time to think) and we almost never give our teachers enough of that. Dr. Kho's great insight, as developed by two generations of great math teaching (mostly in Asia), is that preparation for the highest level of mathematics a student can reach (whether that's a developmentally-delayed student learning to count change, or a whiz kid starting calculus before puberty) requires a coordinated, integrated, developmentally appropriate balance between fundamental skills and mathematical understanding. In Singapore Math classrooms as set up and run by Dr. Kho and his colleagues, students actively pursue quick and ready skills to comprehend more, and use their better comprehension to sharpen and direct their skills. That virtuous circle works because it's not just a means to some end like higher test scores, better job prospects, increased self-esteem, or parents getting off teachers' cases. Singapore Math is fundamentally about starting and feeding the cycle of correctly-related proficiency and understanding, spiraling upward into confident mastery of as much mathematics as the student ultimately chooses and can handle. Bluntly, I think my own sloppy, often willfully dumb country will probably screw up the introduction of Singapore Math. Teachers who have a horror of drills and skills will try to teach only the "understanding" part; teachers who like the old algorithms will find the parts of the book where they can drill those and skip over "all that theory stuff"; many teachers won't see how the two parts are related because no one will pay anyone to explain it to them. Our big sloppy stupid impatient country will then blame everyone except our own unwillingness to spend the money, and more importantly the patience and care, to do it properly. Something in the American psyche thinks that if you can't win a game of tennis, the solution is not lessons, not going back to fundamentals, not training, but buying a newer, more expensive racket, and then busting it over your knee in a fury when you're still a crappy tennis player. So one auxiliary part of the book is my history of past reforms and why they didn't work; and this first part is a history of why reforms were needed in the first place. I suppose you could call it, as I do above, so what was wrong with American math teaching in the first place? This week we'll look at what's wrong with the oldest American tradition, traditional proceduralism, the "basics" that some people always want to go "back to," because to understand how reasonably smart, honest people made their mistakes, we need to understand what earlier mistakes they thought they were going to fix. Traditional proceduralism led us into digging a hole we can't afford to stay in, and the time has come to climb out of it, for the future of our kids and our country. And as common sense tells us, you can't get out of a hole by digging. Unfortunately, many subsequent reformers tried to get out of it by pretending it's not a hole, believing they could fly, or holding the shovel upside down. But we'll pick on them in the weeks to come; for the moment, let's see where Grandpa's way went wrong. taught to the tune of the hick'ry stick"
That song was a big hit in 1907, the year my grandfather was born, and in it, an old couple are reminiscing about their pre-pubescent schoolkid mutual crush, presumably several decades before in the 1840s or 50s. Given that I'm a grandfather myself, that's about nine generations of nostalgia. "School Days (When We Were A Couple o' Kids)" gave us that illiterate phrase the "Three Rs." I do not think it's any accident that in addition to celebrating that literally "old school" curriculum, it also celebrates writing with chalk on slates, kids coming to school without shoes, and teachers beating kids with sticks. Among our citizens, one strain in thinking about education seems to dislike kids and feel that pain, privation, shame, and misery, especially if pointless, is what the little scum deserve. It's an impulse that never seems to be far below the surface in present-day conservative critics of education, a part of the impulse behind some charter schools and homeschooling, a notion that often underlies "back to basics" and "in my day..."
So let's begin by dismissing the nostalgic attraction of that little red schoolhouse. It's a story about as meaningful and true as George Washington's cherry tree, or the depictions of happy slaves in the cotton fields. The one-room schoolhouse steeped in rural poverty and staffed by the only single woman in the county who could read hasn't really existed since about World War One. Joe and Nelly in "School Days" would have been a couple o' kids well before the Civil War. We might as well look for contemporary American fashion and activities in Currier and Ives prints. Traditional proceduralism began in the methods first used to train the children of the merchant and shopkeeper class in the Renaissance for reliable bookkeeping. Kids memorized step-by-step procedures, usually organized as patterns of manipulating symbols. This was thought to train and develop the mind, just as throwing straight punches into a heavy bag and doing lots of pushups will train the triceps. The same principle later underlay memorizing long vocabulary lists, state capitals, chemical elements, and so forth. The mind was mostly memory, memory was a muscle, muscles needed developing, and muscles are developed by exercise. The harder the exercise, the more development: no pain, no gain. The mind developed just as well regardless of whether what it was working at something useful or just working, just as it didn't really matter if you were throwing hay bales in the field, or doing bicep curls in a gym. Perhaps an example will make this clear: before 1890, nearly all public schools in the U.S. required eighth graders to be able to extract square and cube roots with pencil and paper. As late as World War II, a large number of kids had to learn it. Chances are that no one taught you how. If you try to learn, you'll find that there are many more, and more complicated, steps than you ever encountered in long division. (You might say it's all the difficulties of long division, squared and cubed). Your three-times-great-grandfather probably did it for an hour a day for several weeks to learn it in sixth grade, if the records of nineteenth century schools are to be trusted. According to surveys taken in the 1930s (admittedly, by education researchers who were trying to release children from extracting cube roots by hand), the great majority of students were never told how or why the method worked, and a substantial proportion of your great-grandfathers who could extract roots had no idea what a root was. Is there anybody who feels that you are missing something by not being able to extract roots by hand? Do you wish you'd spent more of your childhood learning a lengthy, complicated process to produce a number that you might or might not understand? And do you wish you had been taught it under threat of being paddled or slapped (which would not be permitted in boot camp today)? Please notice I'm not asking whether you think it was good for kids; would you personally like to have a memory of being spanked for not knowing your cube root extraction algorithm by heart? So to begin with, harsh, uncompromising meaninglessness partly provoked the original reactions against traditional proceduralism, and might partly explain some of its enduring attraction. Some people just like to wallop kids. But that is not and cannot be the whole story. Nowadays, traditional proceduralism is taught with immensely more patience and kindness than it used to be. The teacher doesn't make the kids who failed the quiz over the sevens table face the class to be laughed at. A kid who gives a dumb answer is not rapped on the knuckles with a ruler, and a kid who asks a dumb question is not made to sit in a corner; getting math wrong or not understanding it is no longer assumed to be willful criminality or moral shame. We don't declare that on Friday every student will work a long division problem on the board and those who cannot do it will receive three hard whacks on the buttocks with a hick'ry stick. Traditional proceduralism with kindness, patience, and explanations demonstrably works much better at developing children's math abilities than the old traditional proceduralism via conformist brutality did. So let's stipulate that nothing would stop us from teaching it kindly and gently. Without that aggressive, kid-hating emotional understructure -- without the stick -- without the spirit of "because my great-grandpa could calculate sines by hand, that's why!" -- what positive benefits does traditional proceduralism offer? What strengths make it so persistent among people who show no signs of hating kids? And are those benefits and strengths adequate to our present needs? The answers are more complicated, interesting, and ambiguous than many education professors and reformers would like to talk about. Let's begin right at the heart: what does traditional proceduralism say that mathematics is, and how does it say we should learn it? In traditional proceduralism, a student learns to copy and memorize patterns of manipulating the symbols for numbers, with relatively little immediate attention paid to understanding how or why it works or why s/he is expected to perform these procedures. a. write the two numbers one above the other, matching columns. b. multiply the third digit of the top number by the third digit of the bottom number. 1. If the result is less than ten, write it in the rightmost column of the first subtotal. 2. If the result is ten or greater, write the right hand digit in the rightmost column of the first subtotal, and the left hand digit as a small note to the upper right of the second digit of the top number. That small digit is called the "carried" number for the next step. c. Now multiply the second digit of the top number by the third digit of the bottom number, and add the carried digit to them. 1. If the result is less than ten, write it in the second-from-the-right column of the first subtotal. I hope you've been skimming; that's why I boxed that section, as I'm not trying to teach you to multiply (if you need that, there's help in Part 2), but to see the basic approach. Notice that the student is not supposed to be thinking about what the top and bottom numbers are -- to the procedure they are just collections of digits -- and that the first subtotal is also purely a set of symbols that the student is building up from right to left (the opposite direction from the way we read a number). A well-trained chimp or a well-programmed machine could do this, and neither the chimp nor the machine -- nor the kid -- has to have any understanding of what's happening. It's about putting symbols in the right boxes, rather like crosswords, sudoku, or filling out tax forms. p. add any carried digits to the leftmost digit in the third subtotal, and write the result in the leftmost column of the answer. q. count the total number of places to the right of the decimal in the top and bottom numbers. r. take the number of decimal places you just counted and counting right to left, put the decimal point that many places to the left of the rightmost digit in the answer. Now, obviously though you (or your great-grandfather) did learn to do something like that, you didn't learn by sitting down and memorizing procedures, certainly not in such complex language. 4. positioning the decimal point with a counting rule. Kids learn more complicated patterns than that all the time when jumping rope, braiding hair or lanyards, playing clapping and chanting games, knitting, tying shoes, or playing tic-tac-toe. Such patterns are the underpinning of folk tales, fairy tales, and plain old jokes in every culture: the troll meets three billy goats gruff, the prince dances with three sisters, and Goldilocks messes up the possessions of three bears; the big goat, Cinderella, and "just right" are the "solutions." Pattern-mastery evolved to activate most intensely in the first decade of life, when kids are learning physical skills, language, customs, and so many other pattern-based behaviors. Consider how fast young kids learn songs and nursery rhymes, and how many of them decorate their belongings with repeating patterns. Because it's the age where they quickly and easily pick up patterns, it's the ideal age for learning a musical instrument, rhymed and metered poetry, and games like jacks or hopscotch. You may have heard that "when you have a hammer, every problem looks like a nail." Young kids learn patterns so easily and quickly that if a procedure can be expressed as a pattern, kids will use it to get through their math homework, and not just because they want to get back to playing video games or snaffling up Disney products (more pattern-based activities). Many kids, maybe most, are also wired to find fun in seeing how quickly and neatly they can run through the pattern of symbols. These are often the kids who later in life will say they "loved math but hated word problems" (because they liked to run the pattern, not match it up with all those messy words) or that they were "good at math till nth grade." That "till nth grade" is the wall that we're going to be looking at in detail: the place where suddenly math stops being easy and fun, and never is again. Typically nth=somewhere between 4th and 7th, far short of what they're going to need. Sadly, the patterning that allowed kids to sail through math up till the wall suddenly rams them into it. Teaching a procedure as a pattern -- that is, as an algorithm -- and evaluating kids on their neatness, precision, and accuracy in following it is fun, or at least tolerable, for the kids who are quick to get it. The rest can be pressured and hassled into tolerating it (usually without the hick'ry stick). Even kids who hate having to memorize the patterns do get a sense of accomplishment once they have done it. Furthermore, because the patterns themselves are traditional, parents and teachers feel a great deal of comfort with them -- whether they understand them or not. It's a bit like growing up in a religion whose holy language you don't actually speak; knowing the pattern is comforting all by itself. But the day of reckoning comes for many students when their memories can no longer hold patterns that are too big, complicated, or hard to apply. The kid who has only learned patterns, and not the math behind them, has no other way to learn more. That's the kid who says, "I can't," and gives up, and that's the phenomenon of hitting the wall. Pattern-mastery is very unevenly distributed to the population. Some people barely recognize a song they've heard a thousand times; natural champions at "Name that Tune" know thousands of pop songs well enough to recognize them from 1-3 opening pitches. Some people can't learn the base step for the foxtrot; Broadway dancers can acquire and retain a hundred moves in one long rehearsal. Some people struggle with remembering the rules to "Go Fish," whereas a professional poker player will not only know dozens of variations on poker but can easily acquire another one from a few-second announcement at the beginning of the game. In those examples, the natural champions, Broadway dancers, and professional poker players are of course "good at" song-recognizing, dance, and poker; "some people" are obviously hopeless doofuses who "just aren't good at it." They might have started off able to remember a few nursery songs, the macarena, or basic solitaire, but at some point they ran into patterns that overwhelmed them, and went from being "good at it" to "not good at it." In traditional proceduarlism, which area of math will be the wall for any given kid depends on how much of a natural patterner s/he is. The most common "I don't get it" points for people who were "good at math until ..." are places where patterns get too long, become too complicated, or stop being relevant. Fractions can be processed by regular procedural patterns, but students have to keep track of numbers that are expressed as relations of numbers. 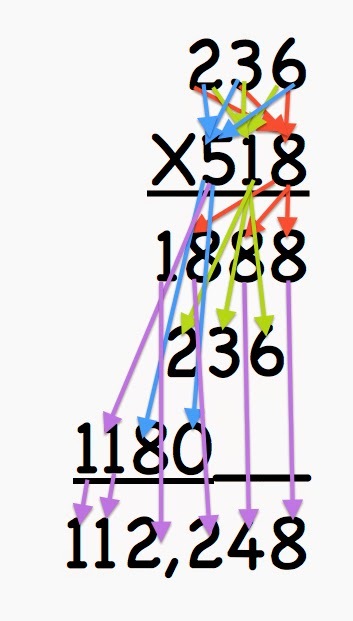 Long division can have any number of steps at all, and introduces a branching procedure, i.e. students have to make decisions about which of the possible next steps to execute. Exponents and radicals require knowing how and when to insert the PEMDAS rule into a procedure. All of these are far more complicated and require far more decision-making than the early-grades down-the-column or make-an-x patterns for basic addition, subtraction, and multiplication; many people who can remember a simple pattern with no branching decisions become hopelessly lost in a complex, branching one. "Given this equation, solve for the roots" would be typical of assignments somewhere between seventh and ninth grade for students on a regular track. A student proficient at mental math and with a good head for strategy (two things Singapore Math excels at developing) doesn't even need to write anything down. S/he sees the 12x and the 3(4x) on opposite sides of the equation and realizes that the x terms go away, then sees that all the remaining terms divide by 6, reducing it to x2+8 = 3(8), which is easily resolved to x2=16, so x=4 or x=-4, the two roots of the equation. Other students will do various other kinds of expansion and reduction until they can factor a solution by the difference of squares method. An exceptionally un-intuitive student with a large set of memorized procedures might even laboriously convert it to standard form and then grind all the way through the quadratic formula, or even awkwardly kludge through the steps of completing the square. Any of those might yield the correct two roots, so there's no one right way. However, there are certainly better and worse ways; the one I began with takes just seconds if you have practice and intuition, whereas the quadratic formula might take a sheet of paper and a couple of minutes. The fastest, easiest strategy for one problem may be a wretched, tangled, confusing mess for another. There's no pattern for choosing strategies, and not every strategy is expressible as a pattern, and even if there is a pattern-based strategy no one can possibly memorize all the possible patterns and the conditions under which they apply. And at that point, many students, who have been trained for years to look for a pattern of "just write this here, then write this, then combine this way," are unable to start. The same natural gift for pattern that makes many small children "good at math" without thinking in math leaves them stranded when they do have to think about math. This connection between traditional proceduralism and hitting the wall has been known and analyzed for more than a century. Just before 1900, Mary Everest Boole, the widow of the great mathematician George Boole and a very formidable mathematician herself, began to explore the problem of teaching mathematics to children. She published her results in 1903, in Lectures on the Logic of Arithmetic. Boole found that for generations, good math teachers had intuited a connection between memorized procedure in the early grades and hitting the wall in later ones. Reverend Thomas Vowler Short, in his 1840 book on how to teach fractions, discussed the fraction barrier and even pointed to teaching arithmetic as a system of memorized rules as the cause: Short noticed that compared to the basic four operations on integers, the rules for manipulating fractions were much longer. They also referred to more abstractions -- you had to remember which was the numerator, which was the denominator, whether it mattered that a fraction was reduced or improper and what that meant, etc. Most importantly, the "higher" fraction rules were less intuitive than the lower arithmetic tricks of borrowing, carrying, and cancelling. For example, most adults who are proficient at arithmetic use the "flip the divisor, then multiply" rule for dividing fractions without thinking about (and often without remembering) why it works. To those who are at all acquainted with the usual method of teaching Arithmetic in England, it can be no wonder that the mass of the children so taught are not fond of calculations. The rules are synthetically laid down, in such language as is not very intelligible even to those who are fully able to employ them, and which to the scholar, when he first enters on the task, must be utterly unintelligible. They are so numerous, that in a work which I have now before me, there are thirty rules preceding Vulgar Fractions, whereas, if properly taught, Fractions ought to follow immediately after the first four rules, as applied to whole numbers. Mary Boole, with the benefit of having spent years promoting and explaining the work of her husband, one of the great logicians of all time, was able to do more than just observe that many pattern-proficient kids hit a wall at a point where their memories simply couldn't handle the tasks at hand anymore. Summarized in modern terminology, Boole's findings were that many kids who learn elementary-level math by treating written numbers as arbitrary symbols -- the same thing Reverend Short called synthetic -- internalize the idea that mathematics is nothing but knowing what pattern to do when. This is a clerk's viewpoint. When that clerk-viewpoint student reaches algebra, he or she is looking for patterns that often are not there and can't be there. Their whole do-this-next concept of math is too small to hold the things they need to learn. (Maybe an analogy will help: Suppose a student has only learned traveler's French and thinks it's all the French there is, believing that the French spend all their time conversing about the way to the post office, what time the next bus for Lyons departs, the price of bread from a sidewalk stand, and the like. S/he will have a bad time trying to read Sartre, not just because of lacking the vocabulary but also because s/he will not even be looking for anything Sartre is interested in talking about.) A reductionist view of a subject is far more damaging than just not being able to recall a pattern for the immediate problem; it's being permanently unaware of even the possibility of genuine understanding. Boole also observed that the few bright kids who stayed "good at math" frequently had a habit of playing with numbers, thinking about how numbers worked, and focusing on the patterns in the numbers rather than in the synthetic manipulation of arbitrary symbols. Eventually, Boole's insight was exploited by Dr. Kho Tek Hong; Singapore Math teaches, encourages, and emphasizes the kind of number-play in the head that most "good at math" people naturally start doing as small children (and most people never really discover because they're stuck in the patterns). "put down one, carry the two"
any solution for x has to be a corner solution." Teaching pattern rather than meaning produces self-satisfied little clerks at eight and frustrated math-phobics at eighteen. Traditional proceduralism's deceptive quality of enabling kids to feel "good at math" (while they're not actually doing math) actively damages the ability of many students to pursue the kinds of higher mathematics that would enable more productive and conscious lives in our present world. Nonetheless, traditional proceduralism lingers on. In part, this is because while it doesn't actively help most students through the conceptual wall of algebra, it does facilitate bright students finding their own way. It wastes much low-level talent but at least it doesn't block high-level talent. (And it is the high-level talent that then survives to write the math standards and define proficiency). Then, too, the relatively few teachers in lower grades who had a genuine mathematical gift themselves have often been able to add enough material about the concepts that underlay the processes. Reverend Short and Mary Boole both dedicated books to math teachers like that, and I've seen some teachers of Saxon Math who always maintained a strong conceptual focus, with extremely good results. Traditional proceduralism doesn't damage everyone, and it's not terrible for a smart student with a very smart teacher; the right student and teacher matchup can slide right over the difficulties and pitfalls. But it lingers on in more than the nostalgic memories of sadists and math wizards. Many ordinary people of average math talent who struggled with traditional proceduralism and know its strange miseries first-hand are still fans of it. Some, as noted above, may simply be the sort of sadist who thinks "if I had to, my kids have to," but surely that is far from all of them. Why would average students who had mediocre teachers, and hit that terrible wall of fractions, long division, algebra, or trig, politically support the system that creates those problems? What strengths does traditional proceduralism offer for students who are not brilliant enough to break the wall? Back when school leaving age was third, sixth, or eighth grade, and society and the economy were very different from what they are today, traditional proceduralism made a certain kind of sense: you taught kids to add numbers in neat columns exactly the same way you taught them to eat with knives and forks, wear matching socks, call God Thou, or spell words unphonetically: arbitrarily and synthetically, in a spirit of "Shut up and do it the right, grown-up way." This is because historically, most people didn't really need to understand math; they just needed practical everyday arithmetic. The traditional algorithms are still the arithmetic you use if you're the assistant manager at a fast-food place. You use them to second-guess the cash register, figure inventory of burger buns, decide how much freezer space is needed for the frozen fish fillets, maybe work out the square footage of the floor to order disinfectant. In the old days, even manual root extraction had a function: finding diagonals. If you wanted to know if Mrs. Smith's couch would fit into your moving van and then through the door of her new apartment, before you tried it and got stuck, you multiplied and added and found square roots and had your answer. If you needed to know how big to make the boxes so that nine tons of coal fit exactly into five cube-shaped boxes, and order just enough lumber to build those boxes, you dusted off your root-extracting skills. If the navy needed gunnery tables or navigational almanacs, they hired a bunch of proficient root-extractors and series-summarizers; ditto if a large bank needed an amortization table. Traditional proceduralism was robotic and factory-like, but back when mass education was starting in the United States, the business world desperately needed very large numbers of people to do routine, repetitive math accurately. Since most people's work was dull and repetitive anyway, it made sense to do arithmetic in a way similar to packing kits in a factory, following the corporate recipe in a chain restaurant, or maintaining a rifle in the army. As late as the 1930s the U.S. Department of Commerce was forecasting bright prospects for "computers." In those days, that didn't mean the machines that a few top-level mathematicians, scientists, and engineers were working their way toward inventing. It meant people who could do hundreds of long divisions, trigonometric calculations, and square root extractions perfectly every day, with pencil and paper and perhaps, in an advanced shop, the help of adding machines, log or trig tables, and slide rules. Of course it was also a culture where large numbers of American children younger than ten were digging coal, chopping cotton, assembling machine parts, and sewing piecework. The traditional elementary school math for which so many people feel so much nostalgia is aimed at producing many people who would make great clerks at Old Eb's General Store, Haberdashery, and Pharmacy in East Podunk in 1914, and a favored few who could do the steam table calculations for Marks's Standard Handbook for Mechanical Engineers. But whether you want your kid to rise higher than retail clerk, or just doubt that there will still be jobs for retail clerks throughout your kid's working lifetime, for those great STEM jobs, or to be able to manage STEM workers, or just to understand most of the news of the 21st century, they need to really understand real math. The first step, as a nation, to becoming genuinely good at math, is to lose the myth of a mathematics-proficiency Golden Age. There was not a time in the Wonderful Past when everybody was good at math. There was only a time when a larger fraction of people could calculate quickly and reliably -- a good thing, and a mathematically useful thing as Dr. Kho points out because it's almost impossible to maintain enough concentration to learn higher math if your mental calculation isn't quick and reliable. So, sorry, teachers and parents who are hoping the new and better way will mean that your kids are off the hook for all that dull drill, practice, and memorization. The boring memory-and-procedure loading parts are essential for the proficiency that makes learning Singapore Math possible, and in fact kids in the nations where Singapore Math is succeeding spend many hours in intensive drill. Higher order skills are made up of lower order skills, and sometimes to cook, tango, or do math, your wrist just has to know how to flip a pancake, your torso just has to know how to lead a boleo, and you have to look at "eight times nine" and say "seventy-two" faster than you just read it. Kids learning Singapore Math, or any good system devised in the future, will still need to know the multiplication table, but they also really do need something more. But equally sorry, hick'ry stick fans. "Shut up and do it right" wouldn't work even if we still had a culture that supported it. The number sense required to do higher level math has to be introduced, nourished, and fed right along with the most basic arithmetic; the seeds of calculus are there in how a child first learns to add (if she learns it well, as in Singapore Math), and the seeds of "I hate math and I will never use algebra" are there too (and our traditional way of teaching fed and watered them). So traditional math is an accelerated path -- into a wall. It produces some capable people and a great number of mathphobics and partial innumerates. It had to be replaced, and this was apparent by Mary Boole's time. Unfortunately, John Dewey's pragmatist math, the first great attempt to fix things, was at best a huge step into irrelevance, and at worst a direct embodiment of the idea that if people never move at all, they can't hit a wall. I'll pick on that next week. I've been only sporadically conscious for about a week as I have had one of those pleasures of advancing age, shingles. I'm much better today, but keep falling asleep and having no concentration. Tons of stuff to get going on and with luck I'll have the focus tomorrow to do it, but today I mostly hung out on social media and enjoyed being at perhaps 90% consciousness and coherence (relative to me, a not necessarily high standard). Through one thing and another I discovered a pleasant side note: when the 2012 presidential campaign was winding down, I took down the page promoting Raise the Gipper! as I thought political jokes would have the staying power of, oh, let's say zombies in a steambath. I probably should have noticed, though, that trickles of sales continued through Amazon, B&N, and a couple other sites, totaling to 5-10 per month, ever after. Apparently rancid Ronald Reagan and ancient mockery of Republicans was a more popular topic than I might have thought. Anyway, looking at some stats today revealed to me that my direct sales of Raise the Gipper! were still occurring, and had been all along, via the old free sample page (which was up and accessible but not linked here). Apparently the link was still being found on old sites, and a few fans now and then were sharing it. Well, if the old thing can be productive, it deserves a place among the pages, so you'll see it over to the right. I can hardly think of something as appropriate as "the old thing over to the right" and I guess if other folks can take the smell of resurrection, I can take it too. If this is the first you've ever heard of Raise the Gipper!, there's an explanation and about a chapter and a half sample at that page. In brief: in early 2012, far too late to have time to go through regular publishing channels, I had an idea for a short comic political novel, a genre that is now almost extinct but I loved in my misspent youth. So I wrote one very fast (about 5 weeks to write, 1 to edit and format) and put it out there. Some folks gave it favorable reviews on Amazon, it sold some copies, the nation did not actually see Ronald Reagan rise from the dead, Newt Gingrich's brain eaten, or any involvement between evil space bats, Sarah Palin,a gigantic moose grinder, and the Second Coming. Once again the predictive power of science fiction writers was revealed to be a fraud. But, for what it's worth, the old thing is over there to the right, freshly dug up and reeking of its age. If it sounds like something you'd like, shamble on over. Meanwhile, I'll continue recovering. Vaccinate your kids, by the way. Shingles is the recurrence, decades laters, of chicken pox, as an infection of the ganglions around the spinal cord, spreading out along the nerves. If there'd been vaccine for it before 1963, when I had it, my parents, being the responsible sorts they were, would've gotten it for me. And then I would not have lost a week of my life, 52 years later, in mental fog and constant pain. There's a relationship between that and "My Last Bringback," the story that Jonathan Strahan recently accepted for Meeting Infinity, (coming in November from Solaris) but I wrote the story before I had the shingles. Just as well, or it would be an even angrier, more passionate story than it is already. Just in time for Christmas .... the story of anger that burns forever! And that, anyway, is a rambling account of what I've been up to. More real soon, as other stuff gets taken care of.